HAMILTON COUNTY, OHIO – Mosquitoes that were recently trapped on Long Lane in Springfield Township have tested positive for West Nile virus (WNV), a viral disease that can be passed from mosquitoes to humans. Hamilton County Public Health staff will be conducting surveillance activities in the area where the mosquitoes were collected. They will be looking for areas of standing water, applying larvicide, making sure swimming pools are operating properly and advising residents on precautions they can take to avoid mosquito bites. Look for and drain sources of standing water on your property – litter, tires, buckets, flower pots, wading pools and similar items that could create standing water and become mosquito breeding sites. Frequently change water in bird baths and pet bowls. Drain small puddles after heavy rainstorms. Apply mosquito larvicide, sometimes called mosquito “dunks,” to areas of standing water that cannot be drained. The “dunks” are environmentally safe and won’t harm pets. Purchase them at your local hardware store. Cut your grass and trim shrubbery. Make sure screens in windows and doors are tight-fitting and free from defect. Wear long sleeves and pants during peak mosquito hours – dawn and dusk. Use an EPA-registered insect repellent such as those containing DEET, picaridin or oil of lemon or eucalyptus. Always follow the directions on the package. WNV is a viral disease affecting the central nervous system that can be transmitted to humans by mosquitoes. It is important to note that most people who are bitten by an infected mosquito will never become sick. Everyone, however, should be aware of the symptoms of WNV. 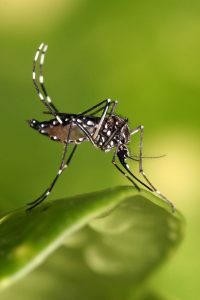 Symptoms may develop two to 14 days after someone is bitten by an infected mosquito. No Symptoms in Most People. Approximately 70-80 percent of people who are infected with WNV will not show any symptoms at all. Milder Symptoms in Some People. Up to 20 percent of the people who become infected will display symptoms which can include fever, headache, and body aches, nausea, vomiting, and sometimes swollen lymph glands or a skin rash on the chest, stomach and back. Symptoms can last for as short as a few days, though even healthy people have been sick for several weeks. Serious Symptoms in a Few People. Less than one percent of people infected with WNV will develop severe illness. The severe symptoms can include high fever, headache, neck stiffness, stupor, disorientation, coma, tremors, convulsions, muscle weakness, vision loss, numbness and paralysis. These symptoms may last several weeks, and neurological effects may be permanent. While all residents of areas where virus activity has been identified are at risk, people over age 50 have the highest risk of developing severe WNV infections. Anyone experiencing any of these symptoms should contact their healthcare provider for evaluation. For more information on West Nile Virus, please contact Hamilton County Public Health at (513) 946-7800 or visit us online. Click here to learn about WNV and other Mosquito-borne diseases. View our West Nile Virus video below or click this link.